She was also known as Margaret. She was also known as Princess Marjorie of Scotland. From 1315, her married name became Stewart. [S323] Sir James Balfour Paul, The Scots Peerage: founded on Wood's edition of Sir Robert Douglas's The Peerage of Scotland (Edinburgh, Scotland: David Douglas, 1904), volume I, page 14. Hereinafter cited as The Scots Peerage. [S11] Alison Weir, Britain's Royal Families: The Complete Genealogy (London, U.K.: The Bodley Head, 1999), page 209. Hereinafter cited as Britain's Royal Families. [S323] Sir James Balfour Paul, The Scots Peerage, volume 1, page 8. [S11] Alison Weir, Britain's Royal Families, page 214. [S323] Sir James Balfour Paul, The Scots Peerage: founded on Wood's edition of Sir Robert Douglas's The Peerage of Scotland (Edinburgh, Scotland: David Douglas, 1904), volume 1, page 8. Hereinafter cited as The Scots Peerage. [S6] G.E. Cokayne; with Vicary Gibbs, H.A. Doubleday, Geoffrey H. White, Duncan Warrand and Lord Howard de Walden, editors, The Complete Peerage of England, Scotland, Ireland, Great Britain and the United Kingdom, Extant, Extinct or Dormant, new ed., 13 volumes in 14 (1910-1959; reprint in 6 volumes, Gloucester, U.K.: Alan Sutton Publishing, 2000), volume III, page 57. Hereinafter cited as The Complete Peerage. [S11] Alison Weir, Britain's Royal Families: The Complete Genealogy (London, U.K.: The Bodley Head, 1999), page 211. Hereinafter cited as Britain's Royal Families. [S11] Alison Weir, Britain's Royal Families, page 212. [S77] Leslie Stephen, editor, Dictionary of National Biography (London, U.K.: Smith, Elder & Company, 1908), volume III, page 89-94. Hereinafter cited as Dictionary of National Biography. From before 10 December 1507, her married name became Douglas.3 After her marriage, Catherine Stewart was styled as Countess of Morton between 1511 and 1513. [S11] Alison Weir, Britain's Royal Families: The Complete Genealogy (London, U.K.: The Bodley Head, 1999), page 240. Hereinafter cited as Britain's Royal Families. [S11] Alison Weir, Britain's Royal Families: The Complete Genealogy (London, U.K.: The Bodley Head, 1999), page 214. Hereinafter cited as Britain's Royal Families. Before his accession, he had been successively joint and sole regent in David II's absence. During his reign, from 1384, his two sons were the real rulers for their unmilitary father. [S11] Alison Weir, Britain's Royal Families: The Complete Genealogy (London, U.K.: The Bodley Head, 1999), page 215. Hereinafter cited as Britain's Royal Families. [S6] G.E. Cokayne; with Vicary Gibbs, H.A. Doubleday, Geoffrey H. White, Duncan Warrand and Lord Howard de Walden, editors, The Complete Peerage of England, Scotland, Ireland, Great Britain and the United Kingdom, Extant, Extinct or Dormant, new ed., 13 volumes in 14 (1910-1959; reprint in 6 volumes, Gloucester, U.K.: Alan Sutton Publishing, 2000), volume I, page 310. Hereinafter cited as The Complete Peerage. [S6] Cokayne, and others, The Complete Peerage, volume I, page 311. [S11] Alison Weir, Britain's Royal Families, page 226. [S323] Sir James Balfour Paul, The Scots Peerage: founded on Wood's edition of Sir Robert Douglas's The Peerage of Scotland (Edinburgh, Scotland: David Douglas, 1904), volume I, page 15. Hereinafter cited as The Scots Peerage. [S11] Alison Weir, Britain's Royal Families, page 225. [S323] Sir James Balfour Paul, The Scots Peerage, volume I, page 17. [S6] Cokayne, and others, The Complete Peerage, volume I, page 77. [S6] Cokayne, and others, The Complete Peerage, volume II, page 376. [S323] Sir James Balfour Paul, The Scots Peerage, volume I, page 16. [S6] Cokayne, and others, The Complete Peerage, volume III, page 509. 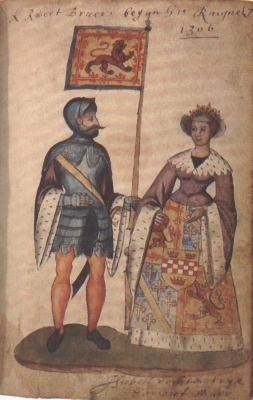 After her marriage, Elizabeth Mure of Rowallan was styled as Countess of Atholl on 22 November 1347. From 22 November 1347, her married name became Stewart. [S16] Jirí Louda and Michael MacLagan, Lines of Succession: Heraldry of the Royal Families of Europe, 2nd edition (London, U.K.: Little, Brown and Company, 1999), table 13. Hereinafter cited as Lines of Succession. [S11] Alison Weir, Britain's Royal Families: The Complete Genealogy (London, U.K.: The Bodley Head, 1999), page 227. Hereinafter cited as Britain's Royal Families. [S323] Sir James Balfour Paul, The Scots Peerage, volume IX, page 2. [S11] Alison Weir, Britain's Royal Families, page 229. [S6] G.E. Cokayne; with Vicary Gibbs, H.A. Doubleday, Geoffrey H. White, Duncan Warrand and Lord Howard de Walden, editors, The Complete Peerage of England, Scotland, Ireland, Great Britain and the United Kingdom, Extant, Extinct or Dormant, new ed., 13 volumes in 14 (1910-1959; reprint in 6 volumes, Gloucester, U.K.: Alan Sutton Publishing, 2000), volume III, page 58. Hereinafter cited as The Complete Peerage. [S323] Sir James Balfour Paul, The Scots Peerage, volume I, page 18. [S6] Cokayne, and others, The Complete Peerage, volume II, page 513. [S6] Cokayne, and others, The Complete Peerage, volume I, page 154.